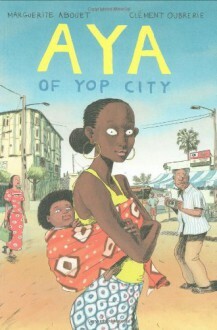 “[Aya] wittily delves into both the political and the pop during an enchanted era when anything seemed possible.” —Vibe VixenThe original Drawn & Quarterly volume of Aya debuted last year to much critical acclaim, receiving a Quill Award nomination and praise for its accessibility and for the rare portrait of a warm, vibrant Africa it presents. This continuation of the dynamic story by Marguerite Abouet and Clément Oubrerie returns to Africa’s Ivory Coast in the late 1970s, where life in Yop City is as dramatic as ever. Oubrerie’s artwork synchronizes perfectly with Abouet’s funny and lighthearted writing, which together create a spirited atmosphere and scenarios that, however unique to the bygone setting, remain entirely contemporary in their effect. The original cast of characters is back in full force, with a case of questionable paternity fanning the flames of activity in the community. The new mother Adjoua has her friends to help with the baby, perhaps employing Aya a bit too frequently, while a new romance leaves Bintou with little time for her friends, let alone their responsibilities. The young women aren’t the only residents of Yopougon involved in the excitement, however; Aya’s father is caught in the midst of his own trysts and his employer’s declining Solibra beer sales, and Adjoua’s brother finds his share of the city’s nightlife. Wenn jemand Graphic-Novel noch nicht kennt, sollte mit die Serie Aya anfangen. Einfach genial.